Providing a high level of public safety training for elementary school aged children. Local schools were requesting more and more Police Department involvement in both counseling youth and being on campuses for crime prevention programs and parent meetings. It was necessary to focus police resources on the high school and middle schools based assessments of critical needs and budge realities. Police department resources were not able to spend more than basic amounts of time at the elementary schools. This resulted in a concern by both the Police Department and the schools that the elementary school aged children were not getting enough training in basic safety concepts. Areas of concern included personal safety to and from school, home alone situations, asking for help, avoiding dangerous situations such as helping a stranger look for a lost pet, avoiding gangs, learning how to avoid computer and internet dangers, dealing with bullying, peer pressures, substance abuse dangers and other areas directly relating to a child’s personal safety. While the schools did have basic safety concepts in their teaching curriculum, it was difficult to reinforce the concepts with the students and parents. A review indicated that more productive methods were needed to provide the children, parents and teachers with additional safety training. After a careful analysis and significant Public input, the City initiated a citizen volunteer program to assist the Police Department in 1994. This has evolved into a program including a group of volunteers who perform duties and provide programs and community services. In 2013 the Police Department developed a program utilizing the skills of its citizen volunteers to address the challenge of providing more effective methods of teaching safety concepts to elementary school age children, their parents and teachers. Programs were developed to teach children in the following critical areas: Child Personal Safety, What to do in Emergency Situations, Home Alone Safety, Buddy System, Observation Skills, Safety Check People, Family Code Words, Strangers Asking for Help, Bullying, Dares and Peer Pressure, Gun Safety, Fire Safety, Conflict Resolution, Drug Dangers, Self Esteem, Tolerance, Bicycle and Scooter Safety, Traffic Safety, What to do if Someone Gets Lost, Avoiding Gangs and Computer and Cyberspace Safety. Teaching aids and materials were developed to be effective for teaching children in the pre-school and elementary school age levels. Teaching aids include hand puppets, visual charts, music and songs, drawings, and other safety materials. Many of these programs and materials are unique and innovative, as each grade level requires a different approach depending on the level of maturity of the children, the teaching environment and home situation. The programs are also readily adaptable for other cities to implement. Children have become aware of how to handle personal safety matters that apply in real life situations – several attempted child abductions have been avoided by children applying what they learned. 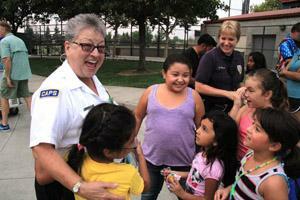 The City is providing meaningful safety programs to elementary school age children. Over 4,700 children have been in the safety classes. 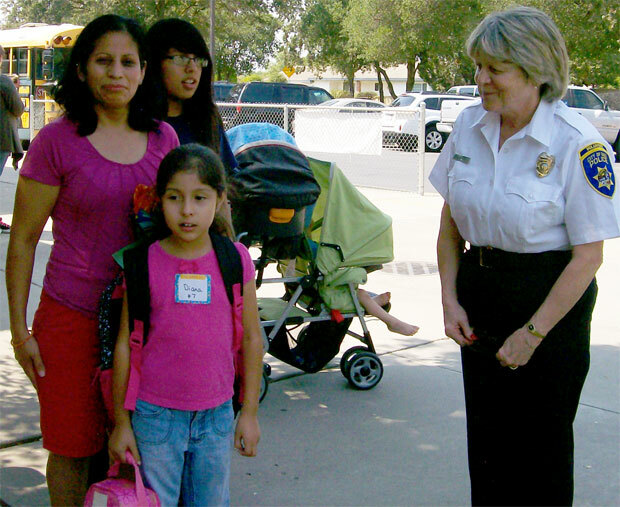 The child safety program for elementary age children has been widely embraced by all of the elementary schools located in the City of Galt. Classes are also taught, upon request, to Head Start programs, private schools, and youth programs. This demonstrates the deep extent of the community in the program including citizens, teachers, children and parents. The citizen feedback has been extremely positive and the classes and volunteer teachers are in constant demand. This has been a highly cost effective program for the city. There has been virtually no cost to the City. Results are measurable by the added safety of children. The program is easily transferable and other cities can request the teaching materials for their own use. The Police Department volunteer leading this program is known by children throughout the elementary schools and youth groups as “Grandma Cop.” The presence of the instructor wearing a volunteer police uniform has resulted in a major difference in how the children learn with safety lessons. They pay attention to a uniformed police volunteer who is well informed and skilled at teaching. This is a true partnership of the people and resources of the City, schools, youth groups, children, parents and citizens. This is a great example of many people working together to benefit the well-being of the community. This program prepares children at a young age to become aware of personal safety issues and to be better informed regarding their responsibilities for themselves and others.